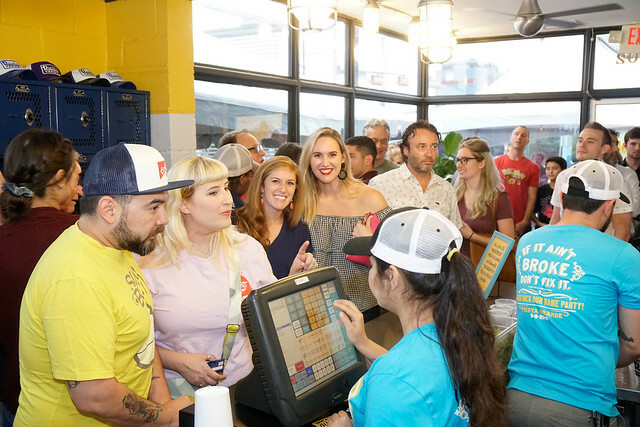 Inspire Brands Chief Executive Officer Paul Brown joined franchisees, team members, and guests to celebrate the return of the Rusty Taco name at its original restaurant in Dallas, Texas. “This is just the beginning of the next phase of the Rusty Taco journey. The party on the patio (founder Rusty Fenton’s favorite spot) hosted hundreds of attendees and included tacos, margaritas, a limited edition t-shirt, live music from Rusty’s best friend, Jayson Bales, and a grand unveiling of a new restaurant sign by Denise Fenton and her daughters. The Greenville Avenue restaurant was also refreshed with new artwork and hand-painted graphics by popular Dallas artist Sean Starr. Proceeds from the event went to the North Texas Foodbank, which will provide more than 10,000 meals for the hungry in Dallas. “To have the brand come full circle and return to its Rusty Taco roots feels like we are coming home again.